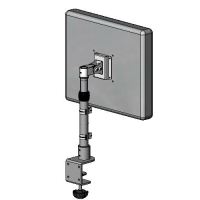 Desk top mount LCD pedestal stand(model #60217 series) - Sallas Industrial Co., Ltd.
Sallas - LCD pedestal allows flat panel monitors to be mounted on a horizontal surface, such a floor, desk top, machine or ceiling etc. yet still offers side-to-side, up-and-down and pivot mobility. Patented counter-force balance monitor tilt angle adjustment and height adjustment provides a best view position for personalizing usage. 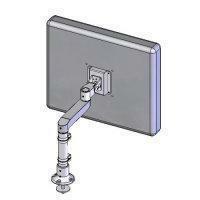 Durable steel construction and metal frame support a flat panel monitor weight up to 11kgs (24 lbs). Effortless vertical adjustment telescopic pole from min. 315mm(12 3/8") to 415mm(16 3/8"). Counter force balance adjustable monitor tilt: 45 degree up and 25 degree down. Conform to the VESA 75mm hole pattern, VESA 100mm adapter is optional. Innovative cable clips for managing cables.